THPRD programs, classes and sponsored activities may sometimes be delayed or canceled by unusually severe weather. We also recommend visiting our THPRD.org home page, Facebook or Twitter for updated closure information. You can also check with your preferred local media source; we keep local media informed when weather conditions force interruptions to our program schedule. In the interest of public safety, inclement weather may necessitate the closure of THPRD facilities. In this event, all scheduled programs, classes and activities will be canceled. When overnight weather results in the cancellation of morning programs, the Park District will evaluate conditions as the day progresses to determine if afternoon/evening programs will be held. Typically, this decision will be posted by 11 am on the inclement weather hotline. When Beaverton School District schools close because of weather conditions, all THPRD-sponsored activities held at BSD locations will be canceled. When BSD delays school opening, all THPRD-sponsored activities at BSD locations will be canceled until BSD opens. When BSD releases children early due to inclement weather, all THPRD after-school, middle-school, community school, sports and other in-school programs will be canceled for the day. Guidelines below apply to all fields owned and/or maintained by THPRD -- including Beaverton School District and PCC Rock Creek sites – and apply to football, soccer, lacrosse, cricket, softball, baseball and rugby. Generally, if it’s not safe for players, or damage to the field may occur, it’s not a good idea to play. Use good judgment. 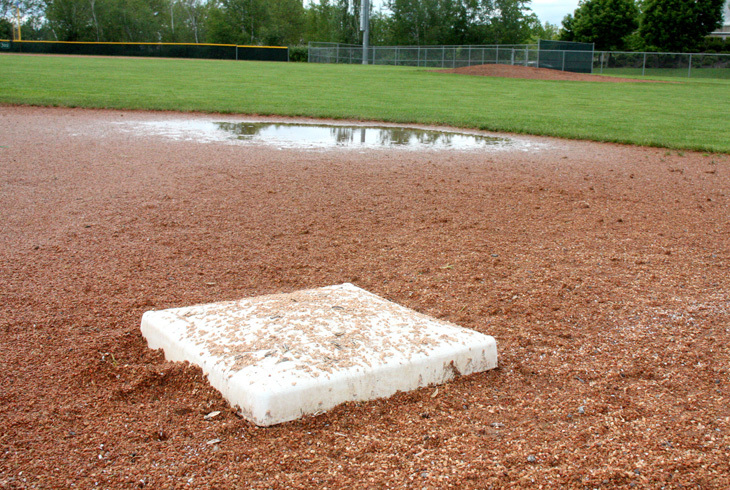 Do not ignore poor field conditions, rainout messages, or inclement weather advisories. Doing so may result in injury and/or fields being removed from use for extended periods of time. There has been 1 inch or more of rain in the preceding 12 hours. The temperature falls below 33 degrees. Ice, snow, frost, slush or visible pools of surface water are present on the field. When someone steps on the field, water shoots up, water pools near the individual's feet and/or their foot sinks into the turf or leaves a print. Please share this information with coaches and field coordinators in your association. Their cooperation will be key to preserving our fields in a safe and playable condition. Rainouts will be posted on our field condition hotline: 503-629-6395. In-Season: Partial schedules may be played. On weekdays, updates will be recorded at about 3 pm (youth) or 4 pm (adults). On the weekend, updates will be recorded at about 7:30 am (youth) or 3 pm (adults). The current field conditions at the HMT Complex, Sunset Park, TVWD and PCC fields.